DUMBARTON shared the spoils when they travelled to play Albion Rovers at Cliftonhill in the Alan Reid Testimonial Match. 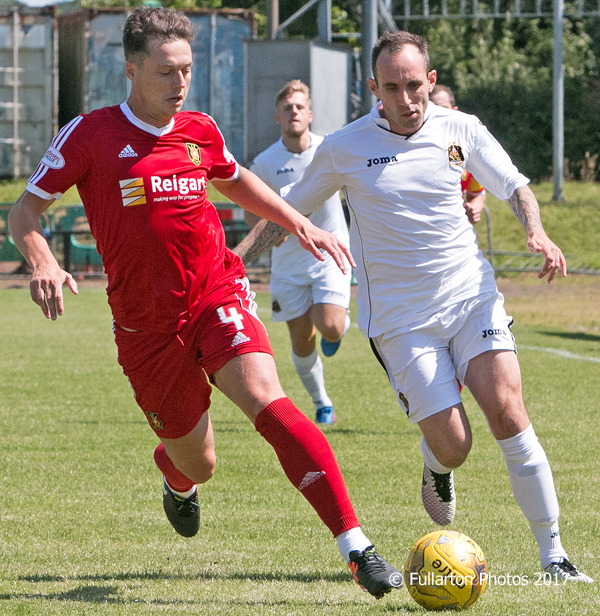 DUMBARTON shared the spoils when they travelled to play Albion Rovers at a very sunny Cliftonhill in the Alan Reid Testimonial Match. It was Sons first open door match of the new season, and manager Stevie Aitken fielded several of his signings and some trialists in an entertaining if not too demanding encounter. Rovers opened the scoring early on with a Joao Voctoria goal from distance, and the game flowed from end to end. The visitors looked more convincing in the second period, with new signing Mark Stewart and sub Christian Nade combining well up front and pressurising the defence. However it took until the last ten minutes before they levelled the score, when Calum Gallagher broke through the middle and netted. The picture shows Mark Stewart getting the better of Jason Marr.